How can a nonprofit build open communication with its staff and board?Even in today’s emailing and texting environment, is there no replacement for face to face communication?How can a nonprofit use creative thinking to add value to an organization?What are some things that will elevate a nonprofit to the top of an organization’s funding priority? Patrick Wathen believes that at the root of any problem is a communication issue, and that communication is key to any solution. That philosophy springs from a long and varied career in the media and corporate communications. Wathen will retire in early 2017 after 20 years with Toyota Motor North America, assigned to its Indiana manufacturing facility in Princeton. 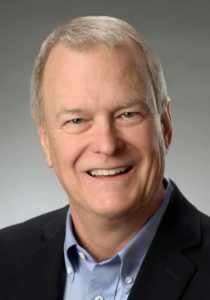 Wathen joined Toyota in February 1997 as part of the Indiana start-up team, with initial responsibilities for designing and implementing the company’s internal communications strategies, developing the extensive new hire orientation program, and writing certain human resources policies and the team member handbook. Wathen worked on a team that established Toyota Indiana’s strategy for maintaining a positive work environment, and continued in subsequent years to improve that strategy. He developed and presented front-line supervisor soft-skills training focusing on communication and Toyota values. Over the course of his Toyota career, he worked closely with Toyota Indiana’s presidents, both Japanese and American, to formulate and write their internal and external messages, both written and spoken. More recently as part of the External Affairs team, Wathen wrote crisis communication plans for many of Toyota’s U.S. manufacturing plants and trained employees to use those plans. At the same time, he is responsible for the day-to-day operation of the Toyota Indiana Visitors Center, including exhibit improvements, marketing and staffing. Wathen also has responsibility for Toyota Indiana’s philanthropic efforts. Before joining Toyota, Wathen was employed for more than 28 years as an award-winning writer and editor at The Evansville Courier. His experience included a stint as metro editor leading a staff of 23 editors and writers.